My excuses for being a bit late, I am on the nighshift, so I hadn't time earlier to publish our new episode(s). Yesterday I tried to inspire you through tanka by Jane Reichhold and today I love to inspire you with a few beautiful haiku written by her. 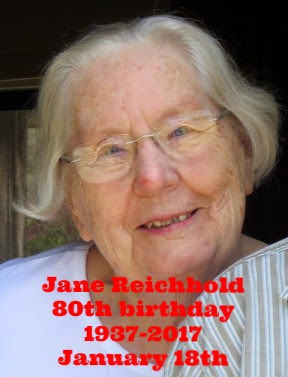 As you all know, Jane would have become 80 if she was still alive, so therefore I have organized this special week to honor her. Three nice haiku. I love that 2nd haiku the most. The beauty of still water holding the babbling of the brook ... a little gem ... no a masterpiece I would say. This episode is NOW OPEN for your submissions and will remain open until January 26th at noon (CET). You are right, cher Chev, the 2nd one is an absolute beauty, echoed by yours. Chèvrefeuille, such lovely work you presented from Jane and your's is a stellar response!